1: LA7GIA, not my first Norway on 80M by any means, but first QSO with Ken on 80M. Confirmed via LOTW this morning. Also worked LA4C during IOTA. 2: SX5R, my first ever QSO with Dodecanese on 80M. Confirmed by log match on Clublog this morning. You would think with me being on 80M all the time I'd have worked Dodecanese a zillion times before, but no, this was my first one. Who would think that July would be such a great time to work Europe on 80M. Worked and confirmed TI2CC - 17M phone - today, for yet another challenge counter. 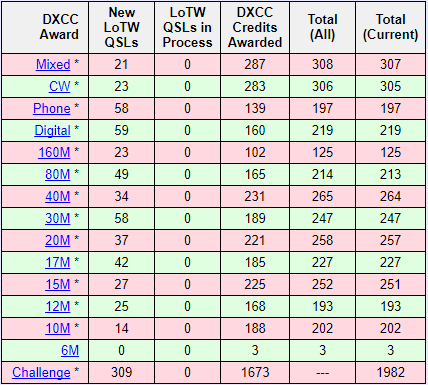 I am now just 18 away from DXCC Challenge 2000 via only LOTW. I would like to think I can get to 2000 by the end of the year but it seems like an asymptotic curve! Yes I have some additional paper cards to push me over 2000 easy but am too lazy to get them checked. With regards to LoTW - anyone know if S01WS provide LoTW anymore? I have enquired about a LoTW upload for my remaining Qs for a long time, as I already have twice of their QSL cards. But no answer from them! It's bad reputation when you do not even bother to answer enquirys, and do not offer free LoTW when their "customer" already have several cards. I had S01WS reply with both paper card and LoTW upload. All of my S01WS LOTW confirmations came a year or more after the QSO. And often a year or more after the paper card. 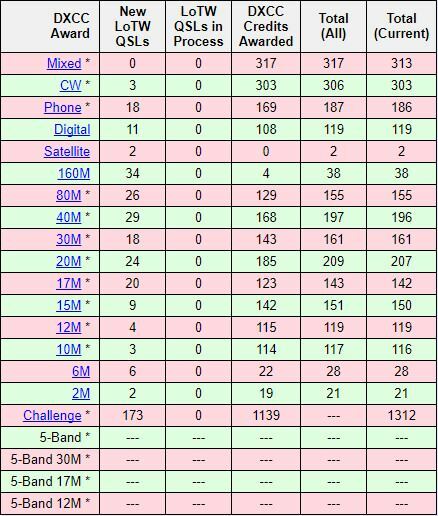 The last one I have confirmed in LOTW is April 2015, and I have 8 QSO's since then which are confirmed by paper cards but not in LOTW. HB9OAB today via LoTW. Satellite QSO on AO-10 from 1995! Z81D confirmed via LoTW today. Wow Tim that is nice!! I'm slowly edging towards 1500.. but still have a long ways to go. CP4BT latest in LoTW for me for a new one on 80m. Nice quick confirm. Nicolas, could you double-check that? I worked Z81D yesterday, but no LOTW received today, nor do I think he uses LOTW. The ARRL LOTW website says: "Last upload for Z81D: No log data found". Both of my Z81D QSLs have come via his QSL manager (OM3JW). None from LOTW. VU2CPL 2017-08-02 80m Digital - confirmed within 2 hours of QSO - Thanks! Sorry you are absolutely right. No LoTW for Z81D on my side. I confused with QRZ.com confirmation which has no value for DXCC awards..
After 16 years I received a QSL from C91MR. I was sad to learn G3MRC passed away earlier this year. However G3SWH does have the logs of many of Joe's operations. It looks like the AN400x special event stations have now uploaded to LOTW. I have confirmation for all 17 QSOs with the AN400 stations on the 40, 20, 17, and 15m bands (all SSB).